Whether it's the Halloween season or not, students love engaging with spooky and creepy stories. Why? The suspense! This resource provides not only a graphic organizer to close-read a text for the tension and suspense built by the author, but it also guides your students through the process of composing the next chapter or section of the story themselves! 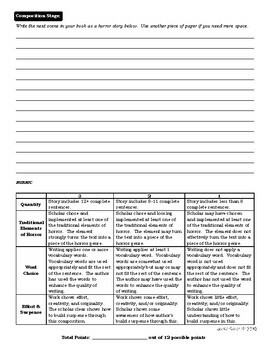 Teachers can expect to be impressed by their students' suspenseful writing with this handout as well as appreciate the built-in writing rubric for grading the assignment!